We use PayPal as our merchant account. It is recognized worldwide as the most secure way to do business on the internet. Here are the most common questions We are asked concerning our Funnel Cake Batter Dispensers. If You have a question not answered here...please, don't hesitate to e-mail us with your question. We believe every question a person may have is important and deserves an answer. 1. Does the Funnel Cake Batter Dispenser use electricity? Answer: No, the Funnel Cake Batter uses CO2 (carbon dioxide gas) as the means to pushing the batter down the hose into the pouring wand. 2. Does the Funnel Cake Batter Dispenser run on an air-compressor? Answer: No, air which is compressed from an air compressor contains minute amounts of oil which would contaminate the batter. 3. Do I need anything else besides the Funnel Cake Batter Dispenser, or will I need a CO2 tank? Answer: Yes, you will need a CO2 tank or bottle just like the one you use for your soda dispensing machine. You can purchase one or rent one. 4. Does the batter in the Funnel Cake Batter Dispenser stay cool? Answer: Yes, the batter will remain at a cool temperature...approximately, 480 Farenheit. CO2 is a natural refrigerate. 5. Does the CO2 carbonate the batter in the Funnel Cake Batter Dispenser? Answer: No. CO2 does not carbonate the batter it provides the push from on top of the batter. 6. 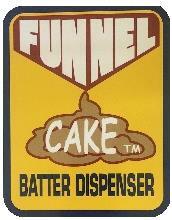 How fast does it dispense enough batter for a 9 inch cake? 7. Is it difficult to clean the dispenser after use? Answer: No, included in your purchase is a back-flush connection which cleans the dispenser in a manner of a few minutes. 8. Where can I get a CO2 tank? Answer: Welding supply stores; Pepsi or Coke distributors, etc. 9. Do I fill the dispenser completely to the top of the canister? Answer: No, there needs to be at least 6" (six inches) of free space from the top of the lid to the batter so that the CO2 can fill that area and provide the push. 10. How much mix will the dispenser hold? Answer: Approximately, 12.5 lbs. of "dry" funnel cake mix with water added. 11. Can I use the dispenser for cooking pancakes? Answer: Yes, it dispenses pancake batter. 12. Can I purchase replacement parts for the dispenser? Answer: Yes. However, you must be in our database as having purchased a Funnel Cake Batter Dispenser. In other words, we don't sell parts to individuals attempting to build their own dispensers. 13. Can I store the dispenser canister with batter in it in a walk-in? 14. Can I get a replacement Operating Manual? 15. Do I get a Warranty? Answer: Yes, We give a 90 day limited warranty against part/s defect or malfunction. 16. Can I purchase a Funnel Cake Batter Dispenser by some other method than using PayPal? Answer: Yes, e-mail us for details if you prefer a different payment option. 17. How much pressure should I set the CO2 Regulator on? Answer: 20 lbs. p.s.i. However, depending upon the viscosity of your batter a slighter higher or lower p.s.i. can be used. 18. What does it mean if the pouring wand spits? Answer: It means it is time to refill the canister. However, if the canister is tipped slightly there is enough batter left for one to two cakes. 19. Can I mix the dry funnel cake mix with water in the canister instead of mixing in a separate container and pouring it in? Answer: No, it is not recommended. 20. Can I get a Refund if I don't like the Funnel Cake Batter Dispenser? Answer: Yes, limited to 10 days from the purchase date, and if You have not dispensed batter from it. In the 14 years we have sold our Funnel Cake Batter Dispensers we have yet to have anyone return one because they didn't like it. 21. What are the dimensions of the Funnel Cake Batter Dispenser? Answer: Height of Funnel Cake Batter Dispenser (complete set-up) is 22 inches tall, and the diameter of the Canister is 9 inches. 22. How much does the Funnel Cake Batter Dispenser weigh? Answer: 22 lbs. (complete set-up).